insects. Eventually, The Brown Marmorated Stink Bug will expand throughout the United States and Canada. The Brown Marmorated Stink Bugs love to eat fruits and soy beans thus becoming a great concern to our farmers. days in search of protection from the upcoming winter. They will appear occasionally during warm sunny periods in winter, andagain when the warmth of spring finally arrives. In spring the emerging adults mate, and the female will deposit her eggs on the leaves of fruit trees, and by May the nymphs will feed on the fruit trees and by mid-summer the nymphs will molt into adults. They are strong flyers, and will spread out of the infested area looking for a new home for protection from the upcoming winter. 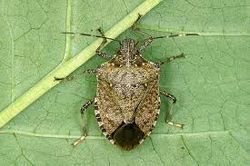 The Brown Marmorated Stink Bug will not reproduce inside a structure nor will they harm humans, they become concerning when they become active in the fall and spring. When squashed or pulled into a vacuum cleaner their smell will become quite apparent.